When it comes to a second season of any given show, the general thought behind it is to give the viewers more of what the shows that they like and provide more adapted material. Depending on the show, it can either further push the gripping story that people want to see the conclusion of, or just...do whatever the first season did in the first place. Continuing the latter trend is Kyoukai no Rinne, the second season that really doesn't have much actual value. Story: Picking off from Season 1, season 2 is virtually the exact same story concept involving a half shinigami boy who survives off of literal pocket change and his seer female classmate dealing with various events and happenings involving the real world and the afterlife. Rinne's story is as basic as stories can go. The entire 25 episode runtime is more or less a mix of episodic running gags that involve classic story writing like misunderstandings, getting in peoples' way to stop them from doing what you don't like, and the classic Rinne standard of poking fun at one high school boy's poverty and how hilarious the concept of not knowing when you'll get your next meal is. Really though, that's about all I can say. You get introduced to new members of the cast who dip in and out of the series's importance, but as far as new content goes, that's about all you'll see. The runtime consists of introductory arcs where our protagonists deal with said new member of the cast, spirit episodes where they deal with some troublesome spirit, or poking fun at Rinne episodes where they...poke fun at the poor boy. Stagnant is about the only thing to describe this series since each episode is more or less the same thing over and over again without any real meaningful progression as the series acts more like a gag manga than anything with a cohesive plot. Truly, average is about the only thing that can describe the story of Kyoukai no Rinne. There doesn't really feel like there's any form of progression, and the story goes back to the status quo to the point that actual progression doesn't exist in the series at all. Characters: Characters are the same as what you see in season 1 with a few minor changes to the recurring cast involving its new members. In terms of our main cast of Rinne and Sakura, these two don't change much at all. Rinne's still the somewhat competent type in severe poverty (because the world loves to rub it in) and Sakura is still the mostly emotionless doll that just casually notes and accepts every little thing that happens around her. The romantic subplot between the two as noted by what exists in the first season does get some progress, but it's so minuscule that it might as well be at a snail's pace. As far as new members go, we have Renge and Matsugo, as well as the two kuroneko contractors of Kain and Ageha, Oboro and Suzu respectively. Like the other members of the recurring cast, they don't really change much in the grand scheme of things. Their characters are basic with zero development, and as such, don't have much in the way of qualities that're worth noting. What I do find odd is the fact that the earlier more important recurring cast members of Ageha and Tsubasa aren't actually all that important. They appear so little that their existences are almost wiped clean by these new characters and it feels strange knowing that previously important characters are now no longer important. Art: Brain's Base's animation for this series is average at best. It looks nice, the colors are good, but the overall animation and quality screams mediocre. It's not that it's bad, but it doesn't have that kind of art appeal that other anime are able to make. Sound: Sound's probably the most forgettable. All of the tracks are ordinary and/or generic and have on more than one been skipped because I just do not care for them. 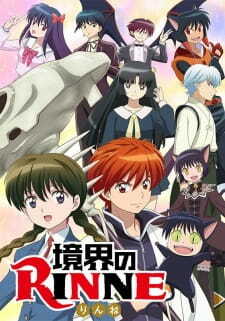 Personal Enjoyment: Kyoukai no Rinne is a strange creature. It's a gag-related series focusing on going back to the status quo whenever the episode is finished and relies heavily on its semi-wacky nature and poor protagonist on creating any semblance of comedy which while does get tiring, isn't so bad that it's worth less than a shrug. As such, I find it very hard to call this show anything aside from 'mediocre.' It doesn't deserve any medals, but it doesn't deserve much or any hate because it meanders at its own pace, so it ends up finding this crossroad for me where I neither hate nor like it, which is an odd feeling. Eh. I've seen worse. I've also seen better, so my opinion on this series is pretty gray at best. I'm a firm believer that jokes should not be overused. Personally, I wasn't a fan of how often the series spent on making fun of Rinne and making even the writing stomp on him to the point that he's crying tears of blood in sadness. Finding a protagonist in an unlucky situation is fine since everyone does that, but when you get nothing but loaded dice that rolls E luck, you know you're probably going a little too far. Would I recommend this series? If you saw Season 1 and liked it, than you should probably watch this for more entertainment. Anyone other than that group, this isn't worth the time quite honestly.